“Music ... furnishes a delightful recreation for the hours of respite from the cares of the day, and lasts us through life,” Thomas Jefferson wrote to Virginia politician Nathaniel Burwell in 1818. And so it has been on Grounds. 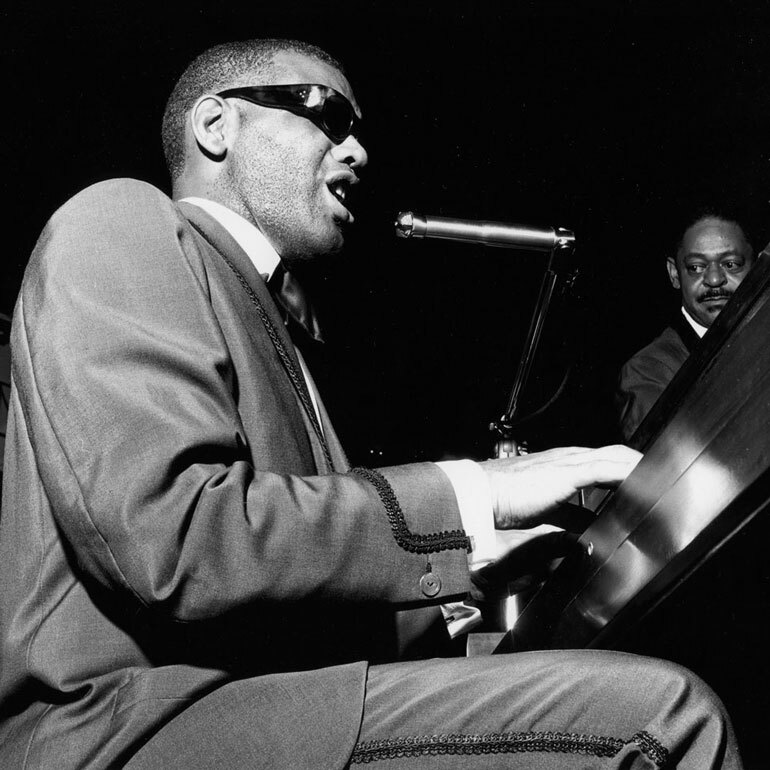 Take a look at concerts at UVA throughout the past 70 years, from Fats Domino to Lady Gaga. We don’t know what Jefferson would have thought of Mick Jagger slinking around the stage at Scott Stadium, but the experience surely provided “delightful recreation” for the thousands of students and alumni in the audience. 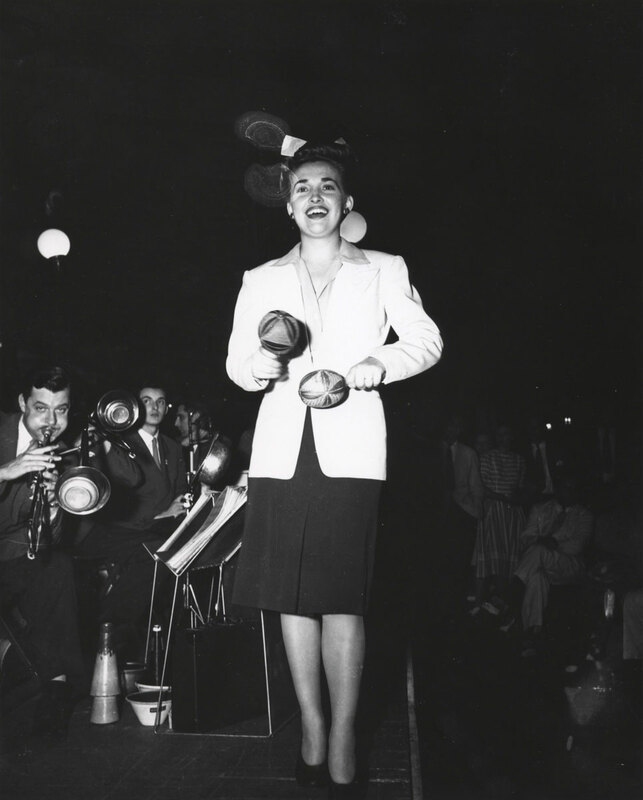 A woman plays the maracas at a concert in Old Cabell Hall, circa 1940. Unidentified musicians perform in Old Cabell Hall, circa 1940. Rhythm-and-blues singer turned rock and roller Fats Domino, known for “Ain’t That a Shame” and many other pop hits, performs at Memorial Gymnasium in 1959. Jazz legend Duke Ellington performs in Memorial Gymnasium in November 1961. Folk trio Peter, Paul & Mary came to UVA in 1962, the same year their self-titled debut album was released and stayed on the Billboard Magazine Top Ten List for 10 months. Folk singer Joan Baez (to the far right) performs in Alumni Hall in 1965. Chuck Berry, one of the pre-eminent rock and rollers of the 20th century, performs in Mem Gym in April 1965. Dionne Warwick, known for such hits as “Walk On By,” and “Anyone Who Had a Heart,” relaxes in her dressing room before a performance at University Hall, 1966. Incorporating elements of blues, rock, folk and country into her music, Bonnie Raitt gives UVA students something to talk about in this performance, circa 1976. With hits like “More Than a Feeling” and “Peace of Mind,” Boston invades Charlottesville with its classic rock sound in this circa 1979 show. Charlottesville gets a taste of country rock when The Charlie Daniels Band and Pure Prairie League headline this concert, circa 1977. In this circa 1973 show, English singer-songwriter Dave Mason—who had previously played in the band Traffic with Steve Winwood—performs with Dr. John, whose mix of blues, pop, jazz, zydeco, boogie woogie and rock earned him induction into the Rock and Roll Hall of Fame in 2011. In this circa 1974 concert, seven-time Grammy winner Doc Watson performs with his son, Merle, who tragically died in an accident on his family’s farm in 1985. Country performer Emmylou Harris, a 13-time Grammy winner, and Leo Kottke—an acoustic guitarist known for his fingerpicking style—play for UVA students in this circa 1974 show. Circa 1976, the British-American rock band Fleetwood Mac—fronted by the distinctive voice of Stevie Nicks—jams out, en route to selling more than 100 million records worldwide. With their fusion of rock, rhythm and blues, Hall & Oates—with huge hits like “Rich Girl” and “Sara Smile” that made them the third-best selling music duo in history—entertain the UVA community, circa 1979. Just a few years before his sudden death, singer-songwriter Harry Chapin—known for his folk rock songs such as the No. 1 hit “Cat’s in the Cradle” —performs for UVA students, circa 1976. In February of 1972, The J. Geils Band—whose hit song “Centerfold” would go to No. 1 on the charts a decade later—rocks UVA. With hits like “Running on Empty,” rock and folk artist Jackson Browne puts on a show in Charlottesville, circa 1977. With an eclectic sound consisting of folk, rock, blues and country elements, James Taylor—who catapulted to stardom with hits like “Fire and Rain” and “You’ve Got a Friend” —performs at UVA, circa 1973. Jesse Colin Young, the founding member and lead singer of The Youngbloods, plays in Charlottesville, circa 1975. With hits like “Cheeseburger in Paradise” and “Margaritaville,” Jimmy Buffett—who came to Charlottesville as frequently as any big-name musician in the 1970s and 80s—brings out the Parrotheads in this performance, circa 1977. The husband-and-wife duo of Kris Kristofferson and Rita Coolidge belt out some of their country and folk hits in Charlottesville, circa 1973. Linda Ronstadt, the winner of 11 Grammy Awards, whose hit, “You’re No Good,” climbed to No. 1 on the charts in 1975, entertains a UVA crowd, circa 1975. Circa 1978, Little Feat—known for an eclectic blend of rock, blues, R&B and country—performs in Charlottesville. Prior to writing songs for Caddyshack, Footloose, and for what seemed like nearly every other 1980’s movie, Kenny Loggins teams with Jim Messina for this show in Charlottesville, circa 1975. Circa 1978, Pablo Cruise—a four-member rock/pop band from San Francisco—lets loose on Grounds. Sixteen-time Grammy winner Paul Simon, known for writing and performing such hits as “The Sound of Silence” and “Mrs. Robinson” with former partner Art Garfunkel, plays Charlottesville, circa 1974. The Preservation Hall Jazz band, which derives its name from a New Orleans venue in the French Quarter, performs at UVA, circa 1978. A funk, soul and jazz composer, as well as a vibraphone player, Roy Ayers entertains at this Charlottesville show, circa 1978. With a handful of hits, including, “Dance to the Music,” Sly and the Family Stone help UVA students get their groove on at this show, circa 1973. A former member of the rock group Buffalo Springfield (he composed the hit song, “For What It’s Worth”), and later Crosby, Stills, Nash & Young, Stephen Stills plays for a UVA audience, circa 1973. The Beach Boys, one of the most influential acts of the rock era who have sold more than 100 million records, play Charlottesville, circa 1975. Country crooner Waylon Jennings, well-known as the balladeer for the television show The Dukes of Hazzard performs in Charlottesville, circa 1978. The Atlanta Rhythm Section, a Southern rock band in the same vein of Lynyrd Skynyrd, known for hits like “Do It or Die” and “Imaginary Lover,” play UVA circa 1980. Blues musician Delbert McClinton performs to an at-capacity crowd in Old Cabell Hall, circa 1980. Detroit R&B group The Spinners, known for “Mighty Love” and “Could It Be I’m Falling in Love,” perform in spring 1981. Blues guitarist Robert Cray plays at UVA in April 1981. Chrissie Hynde, of the English-American rock band The Pretenders, interacts with the crowd at U-Hall during the band’s performance in September 1981. Nigerian singer-songwriter “King” Sunny Adé, who was known as a pioneer of world music, performs in Mem Gym in September 1983. David Byrne, of the rock band the Talking Heads, burns down the house in U-Hall on Oct. 12, 1983. Kool & The Gang, the funk band out of New Jersey, perform at U-Hall in September 1984. The Beach Boys singer Mike Love performs with the band at U-Hall in 1985. The Beach Boys, known for the surfer-turned-psychedelic, California sound, has 36 Top 40 hits—more than any other American band. T-Bone Burnett, today known more for his songwriting and producing than performing, opens for Elvis Costello on April 10, 1985. Blues singer and electric guitarist B.B. King performs at Lambeth Field in the spring of 1986. In 1987, King was inducted into the Rock and Roll Hall of Fame. Singer-songwriter James Taylor and hip hop group Run DMC were both part of the PK German student-booked concert lineup circa 1987-88. Angelo Moore of alternative rock band Fishbone, performs with the band in U-Hall, circa 1989. Reggae artist Ziggy Marley (performing with the Melody Makers) and soul singer Keith Sweat both played U-Hall in 1989. A Tribe Called Quest, a three-member group from Queens, N.Y., considered one of the pioneers of alternative hip-hop music, and Big Head Todd, an alternative rock band from Colorado, headline a show at UVA, circa 1993. In September of 1994, the Dave Matthews Band—which was formed in Charlottesville—kicked off its first-ever international tour with a performance in the amphitheater. Alternative rock band Jane’s Addiction, perhaps best known for its hit song, “Jane Says,” performs in Charlottesville, circa 1990–91. On Homecoming Weekend in 1990, the Allman Brothers—known for hits like “Ramblin’ Man” —perform at University Hall. In October of 2005, the Rolling Stones play Scott Stadium. The show is briefly interrupted by a bomb threat before Mick Jagger and friends rock on. In April of 2001, Dave Matthews Band plays the largest-ever concert at Scott Stadium. Mechanicsville, Virginia, native Jason Mraz plays his pop-rock hits at the Charlottesville Pavilion, circa 2005. In October of 2005, pop-rock band Maroon 5 and lead vocalist Adam Levine, perform at UVA. Former Grateful Dead bassist Phil Lesh and Friends play at UVA, circa 2008. British singer-songwriter and pianist Elton John plays at JPJ in 2008. Irish rock group U2 electrifies Scott Stadium in 2009. Pop star and songwriter Lady Gaga brings her Monster Ball tour to JPJ in 2010. Motown legends the Temptations perform at Scott Stadium with the Cavalier Marching Band for the UVA-Penn State football game halftime show in 2012. Taylor Swift was still a little bit country during her “Red” tour, performing here at JPJ in 2013. Perennial favorite Dave Matthews Band lights up JPJ in 2016. Tariq “Black Thought” Trotter, of the Philadelphia-based hip-hop group The Roots, was one of the many big-name artists in A Concert for Charlottesville on Sept. 24, 2017, at Scott Stadium. The benefit event, which was organized by Dave Matthews, drew more than 170,000 ticket requests and was live-streamed around the world.